If you think that to develop agility and speed for football or basketball is difficult to do, forget it, you can do it with agility ladder drills in order to gain quickness activities more efficient. Any individual can try it. What is agility ladder? Ladder made of rope which is 15 feet in length. The ladder is designed to be easily spread in your home floor or in gym floor and the rungs of the ladder are positioned every 18 inches. 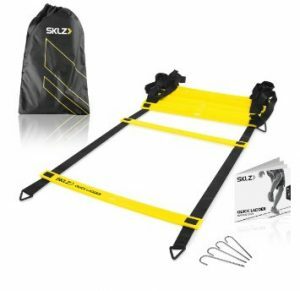 This tools has proven and used by athletes in a several of sports such as football, tennis, soccer, football and many more by allowing athletes to start and stop quickly. This tool is also a good cardiovascular exercise for athlete to develop endurance, stamina and strength. A simple running drill is one exercise that you can do on the ladder. Do not run on the rungs of the ladder instead make sure you run through all the ladder holes. Do the whole drills for 4 to 5 times repetitions without getting your food caught in the rungs and go as fast you can. Take an adequate break in between sets for couple of minutes. In order to develop stamina, speed as well as develop brain coordination, promotes body, enhances precision can be done by running through an agility ladder. To gain benefits of working out with the ladder for non athlete than this is most ideal workout for you by simply run through the ladder. Do a lateral shuffle on the agility ladder is a good training fundamental and workout for sports where footwork is important, for example football. Many soccer players and football player perform this exercise periodically. Put your right foot in the first square while left foot outside the ladder. Usually the coach blow a whistle upon the prompt, put your right foot next to the first square and your left foot in the first square. Your right foot is next to the square while your left foot goes up one run in the second square. Do the “shuffle” your feet such that your left foot is now outside the ladder and your fight foot is on the second ladder squarer. Do this way faster until the drill is completed. Take a one minute rest after repeat the routing. While holding a ten pound weight you can do a twist and jump with an agility ladder eventually. Start the exercise by standing on your right foot positioned on the second square and your left foot in the first square. Position the medicine ball near your belly. Twist and jump with your feet facing the opposite direction from the first position when land to move yourself to the third and fourth square of the agility ladder.